There’s deliciousness and spectacle to spare on the Strip and off. Daniel Humm and Will Guidara opened their NoMad Restaurant in Las Vegas on November 14, which added a big exclamation point to a major dining makeover that’s happening across the city. 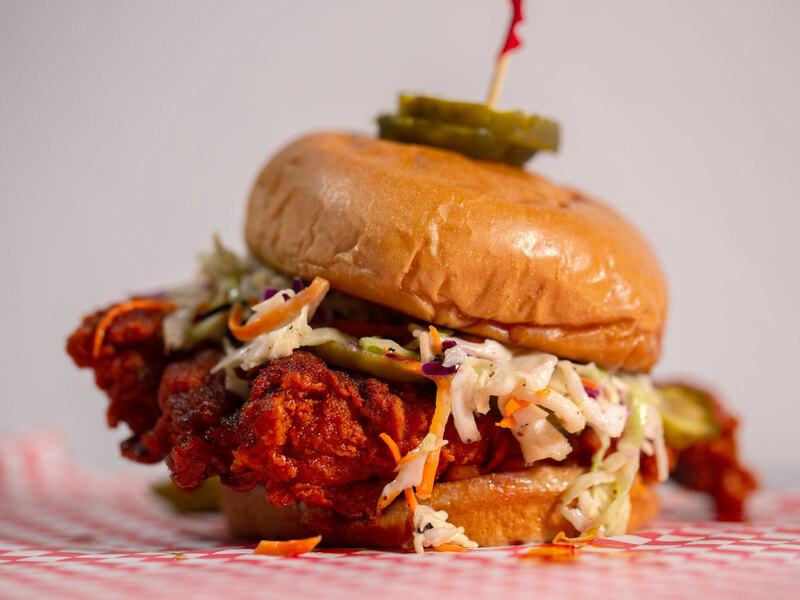 From an off-Strip tapas bar to a glitzy seafood restaurant to Wolfgang Puck’s new Bellagio perch to a food hall with Nashville hot chicken that actually came from Nashville, here are nine new places to eat and drink in Vegas. This is easily the most significant restaurant opening of the year in Las Vegas. Daniel Humm’s now legendary roast chicken, stuffed with foie gras, black truffle, and brioche, is here, of course. Steak tartare is prepared tableside. There’s caviar service and hot-and-cold oysters and desserts that are lit on fire. The truffle soup is inspired by Bocuse, and the beef Rossini is inspired by Escoffier. We recommend ordering the king-crab tagliatelle and the veal tomahawk chop for the ultimate version of surf-and-turf. The dining room with 23-foot ceilings, grand chandeliers, and shelves filled with close to 25,000 books is breathtaking. Is there any question at all that Humm and Will Guidara understand that Las Vegas is a place where things can be a lot more over-the-top than usual? This NoMad Restaurant is a dinner-only destination, but there’s also the adjacent all-day NoMad Bar for your breakfast, lunch, and afternoon-cocktail cravings. Everything blends beautifully at this wine/tapas bar in Chinatown, where you can drink Hungarian furmint while you eat perfect jamón Ibérico de Bellota and watch Vietnamese-born chef Khai Vu cook Nigerian prawns on a robata grill. Vu makes splendid uni bites with brioche, wasabi cream, minced jamón Ibérico, and chives. His comforting bowl of clams, mussels, and chorizo comes in a white-wine/sriracha broth. Vu, whose family has run Chinatown’s Pho So 1 for decades, previously opened Vietnamese restaurants District One and Le Pho in Vegas. He traveled to Barcelona while doing research for Mordeo. He originally envisioned Mordeo as a ceviche bar, and his menu does include dishes like ocean trout tiradito and freshly shucked oysters, but things evolved as he fell deeper in love with Spanish food. Sometimes, he says, you have to get out of your comfort zone and test the limits. Las Vegas is lucky he’s on this journey. And for dessert, Vu nods nicely to his heritage by putting Vietnamese coffee into Mordeo’s affogato. The crispiness and juiciness of the Nashville hot chicken at the first Western United States outpost of Hattie B’s is delightful. We recommend getting dark meat and adding a tender for the full experience. We also recommend not ordering anything spicier than “hot” if you don’t want to feel a lingering burn in your mouth. (For the record, the levels hotter than “hot” are “damn hot” and “shut the cluck up.”) The sweet tea and sides, including greens, pimento mac & cheese, and red-skin potato salad, are also excellent here. Beyond Hattie B’s, highlights at Block 16 in The Cosmopolitan include the porchetta sandwich at Lardo and the mezcal cocktails at Ghost Donkey. The latter is a hidden bar you can find if you look closely for a door with a colorful picture of a donkey. Block 16 is also home to Pok Pok Wing, Tekka Bar Handroll & Sake, and District: Donuts.Sliders.Brew. It’s a Thursday night in Chinatown, and modern French restaurant Partage is packed with couples, ranging from millennials to retirees, indulging in tasting menus. There are also big groups of guests feasting on Ibérico pork that’s cooked tableside over lava stone. There is a lot of smoke and fire and flashiness to enjoy at Partage, where rack of lamb is roasted over binchōtan and where grass-fed rib eye is smoked in a glass box with your choice of hickory, applewood, or hay. There is also a lot of precise, graceful cooking from chef Yuri Szarzewski, who changes his tasting menu every day. Order a tasting and you might get beautiful dishes like parsnip veloute, mahi mahi with smoked leeks, and duck with a spiced poached-pear purée. You will surely appreciate that you’re paying a fraction of what similarly ambitious meals cost on the Strip. At Partage, tastings start at $80 for five courses that include meat, seafood, and your choice of dessert from pastry chef Vincent Pellerin. The glorious desserts are pushed around on a trolley for dramatic effect, of course, and we highly recommend the white chocolate cheesecake with calamansi. Szarzewski, Pellerin, and manager Nicolas Kalpokdjian, who also run EATT Gourmet Bistro, worked at Michelin-starred restaurants in France before moving to Las Vegas together in 2015. At Partage, they’ve managed to merge fine dining with the vibe of a friendly neighborhood restaurant. This place works well for both date night and major celebrations. Vegas clearly has been waiting for an off-Strip restaurant like this. Eugene Remm and Mark Birnbaum’s Catch is a celebrity-friendly hot spot in New York and Los Angeles, so it wasn’t a surprise that the Vegas outpost of Catch at Aria had an opening party/Halloween celebration with George Clooney and Casamigos. 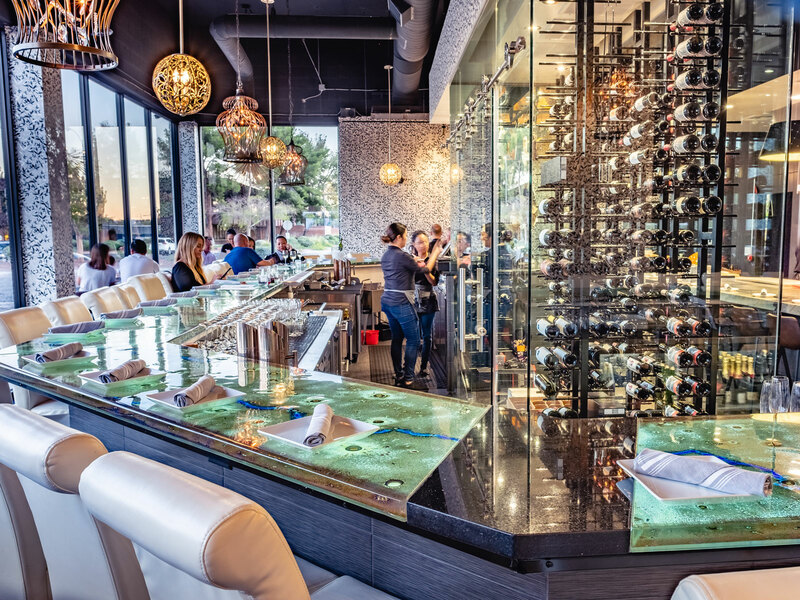 Catch has quickly become one of the buzziest restaurants on the Strip, and this Aria location has already figured out how to dial in luxurious dishes like sashimi with tuna, hamachi, chili oil, ponzu, caviar, and black truffle. We were also impressed by the depth of flavor and texture in the umami-rich spaghetti with wild mushroom, sugar snap peas, tomato, and Parmesan. For those looking to go big in Vegas, Catch has crispy whole snapper, Alaskan king crab, and Cantonese-style lobster. If you want a good cocktail that comes with a memento, order the Meatpacking Manhattan and you can keep the flask. Palms chef Barry Dakake, who used to run the sceney N9NE Steakhouse, has another hit on his hands at Scotch 80 Prime, where mesquite-fired crustacean towers, Creekstone Farms rib eye cap, A5 Japanese Kobe beef, and flawless Dover sole meunière can be paired with vintage Macallan and other rare whisky. 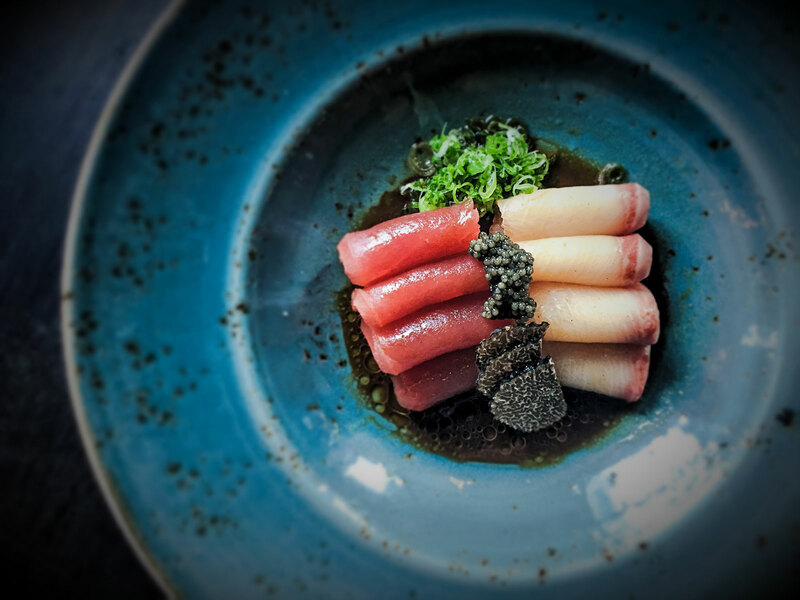 Caviar, truffles, lobster, king crab, and all the other fancy Vegas steakhouse requisites are here. It’s also worth noting that Scotch 80 Prime is part of a tremendous dining transformation at Palms. Marc Vetri’s Vetri Cucina just opened on November 19. Michael Symon will unveil Mabel’s BBQ and hidden “meateasy” Sara’s in December. Bobby Flay’s Shark, a seafood/sushi restaurant “with a Latin beat,” is scheduled for a March 2019 opening. We’ll have a lot more to report from Palms very soon. Spago, which recently reopened at Bellagio after departing The Forum Shops at Caesars Palace, has Wolfgang Puck crowd-pleasers like spicy tuna tartare, smoked-salmon pizza, colossal côte de boeuf, and, perhaps best of all, veal wiener schnitzel. Plus, dishes like baby beets with citrus yogurt, pistachio, sorrel, mint, and marinated feta cheese are a reminder that Puck’s produce-forward cooking has long been at the forefront of California cuisine. Spago’s new perch in front of the Bellagio fountains makes dining at the restaurant a spectacle every day and night. Sam Ross, the star bartender whose credits include New York’s Milk & Honey and Attaboy, created the Penicillin. And now at The Palazzo’s Electra Cocktail Club, Las Vegas has his Penichillin, a wonderful frozen cocktail with Scotch, fresh lemon, ginger, honey, and a hit of smoky Scotch. The Disgruntled Mai Tai, meanwhile, makes things pleasantly bittersweet with Aperol, Curaçao, orgeat, and Underberg alongside two rums and fresh lime. Our waitress was extremely knowledgeable and enthusiastic about cocktails and even told us that the nonalcoholic Byron Bay (fresh passion fruit, ginger, lime, and club soda) is great as is but potentially even better with the spirit of your choice. We’ll likely be back here soon to test out some of the options. This is the third bar in what’s known as the Venetian Cocktail Collective: Ross previously opened The Dorsey at The Venetian and Rosina at The Palazzo. The art-filled makeover of Palms is staggering. This is now a casino-resort where you can bounce around and see works by Andy Warhol, Jean-Michel Basquiat, Takashi Murakami, and Dustin Yellin. But the craziest and most eye-catching piece is Damien Hirst’s “The Unknown (Explored, Explained, Exploded),” which involves a 13-foot-long tiger shark that’s been sliced into three parts. This is the centerpiece of Unknown, the new Palms bar where Hirst designed the logo, napkins, and even the cocktail stirrers. 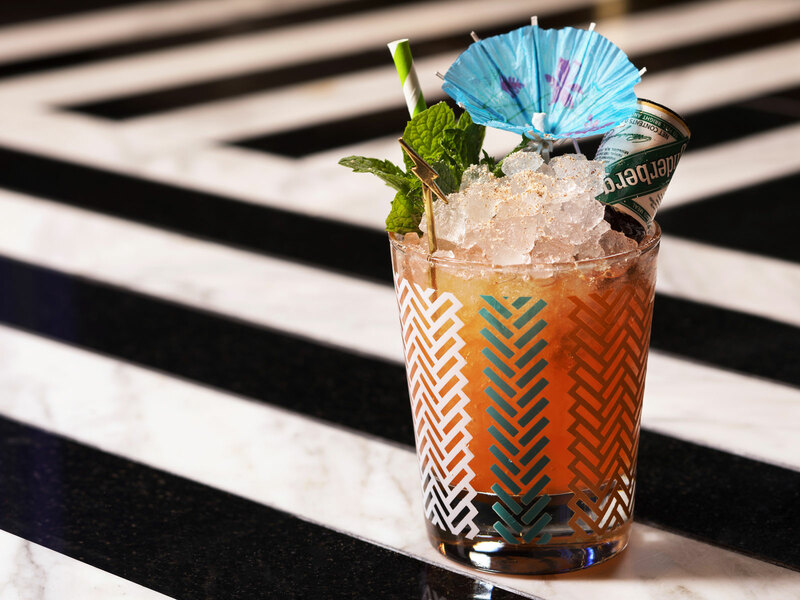 This white-marble lounge is where you can sip carefully made Bee’s Knees and gin and tonics while you enjoy a backdrop that also includes Hirst’s colorful spot paintings.